Nowadays, most people think of Cervicogenic Dizziness of arising after a concussion. We can't forget the higher percentage of patients suffering from Cervicogenic Dizziness after a whiplash, other mild traumatic brain injuries and patients with cervical arthritis. If you see patients with neck pain, then they could have Cervicogenic Dizziness and you need this class! Oh, and don't forget the double entity of Cervicogenic Dizziness with your patients with BPPV. Could this be the reason their symptoms come back?? You can't disregard the highest level of evidence in randomized controlled trials by Susan Reid and her colleagues in the successful treatment of Cervicogenic Dizziness. We definitely go over the powerful effects of this approach! However, if you read outside the physical therapy literature, you will find a copious amount of success in the treatment of Cervicogenic Dizziness from the Chiropractic works, Acupuncture Works, ENTs, Audiologists, and even from Medical Physicians. With over 600 referenced articles in our course, we cover it all to give you the best of the best in all around treatments for Cervicogenic Dizziness. If you want to know how to treat the upper cervical spine joints and fascial points manually and then with follow up exercises, all in one class, this is perfect for you! When my wife and I decided to put together our course, it was both exciting to bring our "two fields" together but challenging! As a manual trained therapist, I have a different "lens" than she does, and as a vestibular therapist, she has a different "lens" than I do. This is what makes our course both unique and personable! You will not find this combination to bring you the best of the best in treatment of Cervicogenic Dizziness anywhere else. For anyone keeping up with trends and advanced in literary works, you will notice that much more data and evidence is arising for the benefit of Sensorimotor Training. Considering the cause of Cervicogenic Dizziness is due to disruption in multiple systems with ultimate failure in the proprioceptive system, you cannot fully treat this condition without Sensorimotor Training. Not only do we teach this approach after our manual therapies, but we have specific approaches and exercise programs for your patients suffering from Cervicogenic Dizziness. When my wife and I came together to write our > 300 page manuscript for our Cervicogenic Dizziness Course, we ultimately realized that Cervicogenic Dizziness was just brushed at the surface in both of our advanced training. 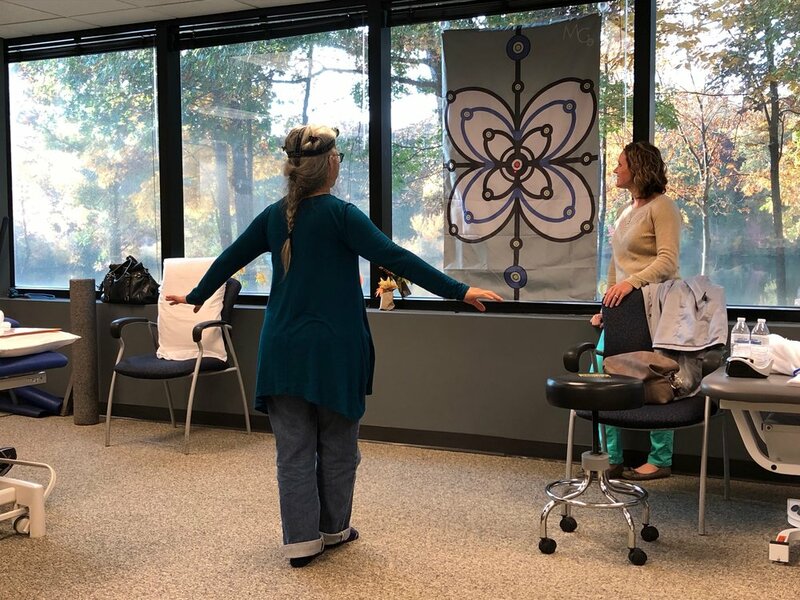 Therefore, we brought together a course that is perfect for a "vestibular" OR "manual" therapist that has the most detail and up to date information for any clinician. If you "think" your patient has this condition or seeing a trend, you ultimately need to take the course to treat it most effectively. Be the expert in both at your clinic! $100 off 2018 courses ends July 6 for Richmond, VA and July 10 for Hawaii! Sign up now to save money! You can learn more about the screening and treatment process of Cervicogenic Dizzinesss through Integrative Clinical Concepts, where the authors (husband–a manual therapist a wife—a vestibular specialist), teach a very unique course combining both the theory and practice of vestibular and manual principles in their 2-day course. Pertinent to this blog post, the 1st day includes the “Optimal Sequence Algorithm”, a multi-faceted physiotherapist approach to the assessment of Cervicogenic Dizziness, which includes the appropriate ruling-out process and cervical examination of the articular and non-articular systems. Also pertinent to this blog post, the 2nd day includes the “Physio Blend”, a multi-faceted physiotherapist approach to the management of Cervicogenic Dizziness, which includes treatments of the articular and non-articular system of manual therapy and the most updated sensorimotor exercise regimen. Newer PostHow common is Cervicogenic Dizziness in Concussion?